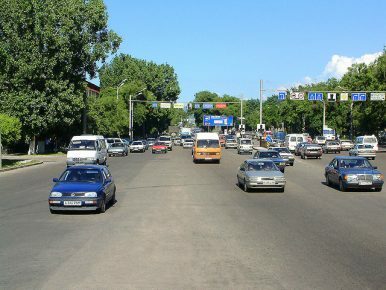 For the past month, lack of gasoline, price increases, and public discontent highlighted Kazakhstan’s infrastructural and institutional impasse. The price for gasoline in Kazakhstan reached 144 tenge (40 cents) per liter in September. At the beginning of October, it had already broken the psychological ceiling of 150 tenge per liter. A report from a village in Western Kazakhstan recorded as much as 200 tenge per liter. The government recently lifted the cap on gasoline prices, which were once fully set by the government. The fuel crisis reached a new level when the flagship airline company Air Astana said it would have to decrease the number of regular flights to cope with the limited supply of gasoline. The Shymkent refinery is the only one in the country that produces jet fuel, which satisfies only about 30 percent of the country’s civil aviation yearly needs. The rest is imported from Russia. Russia played a big part in the creation of the supply deficit in Kazakhstan. The chairman of the national oil and gas company Kazmunaigas, Sauat Mynbayev, explained in an interview that selling imported gasoline in Kazakhstan means losing money. “It’s not just our domestic costs of production. In Russia, gasoline is sold for 220 tenge (equivalent) per liter. Here in Kazakhstan, our price is 150. Nobody would trade in these conditions, not us, not other major companies. That’s how the deficit happened,” Mynbayev said. In an effort to curb the crisis, the government mandated a quota system so that all regions could be supplied with a minimum amount of gasoline. The day after, on October 10, Prime Minister Bakhytzhan Sagintayev fired Asset Magauov, vice energy minister, and reprimanded his boss, Kanat Bozumbayev. Sagintayev lamented that the scheduled maintenance of the local refineries should have been carried out with better planning. Bozumbayev defended his actions by saying that the refineries had to cope with a period of increased consumption, mentioning the EXPO in Astana as part of the higher demand. The minister also highlighted that imports had risen by 40 percent since the beginning of the year, compared with gasoline price inflation which stood at around 11 percent. Despite his justifications, Bozumbayev had to undergo the highest of scoldings in Kazakhstan. On October 11, President Nursultan Nazarbayev issued an official, Soviet-style complaint regarding his actions. Nazarbayev repeated the reprimand days later during a plenary session with the government. Members of the parliament said that firing or scolding public officials would not change the problem of fuel shortages, which has more to do with management and monitoring. In what seemed an emergency measure, the energy ministry secured shipments of 100,000 tons of gasoline from Russia, supplied by Rosneft and GazpromNeft. This amount, according to the ministry, would guarantee fuel supplies for the medium term. At the same time, Bozumbayev announced that gasoline prices will go up in November to around 160 tenge per liter, a level he deemed below the market level of 170 tenge per liter. Lack of funding could have played a major role in shrinking the plan for a full refurbishment of the three existing refineries, according to local energy expert Sergei Smirnov. “The plan initially aimed to expand to 18.5 million tons, after which, the government even boasted it could reach 19.5 million tons. For 2017, however, the goal was set to 16.5 million tons,” Smirnov told local media. This year, however, capacity remained flat at 14.5 million tons. A fuel shortage in oil-rich Kazakhstan could seem a paradox and yet it is a recurring topic. The energy ministry increased its forecast for oil production in 2017 to 84.5 million tons, boosted by the steady growth of production from Kashagan. The domestic refining capacity, however, remains scant and relies on aging plants. Talks for the construction of a fourth refinery in the West of the country are as fickle as ever. As highlighted by Kazmunaigas, it is just not profitable to import expensive gasoline and trade locally at lower prices. However, this means that motorists had to line up at gas stations for hours to secure a minimum supply, which was sold at an inflated price. This escalated into harsh public criticism of the government. As if the situation was not tense enough, the coal-producing region of Karaganda was also hit by a coal shortage, due to the unseasonal cold weather in September. Sagintayev harshly reprimanded Yerlan Koshanov, the governor of the region, for mishandling the situation. Days later, Bozumbayev dismissed rumors of coal shortages, while calling governors to tighten controls over supplies. The fuel crisis also affected macroeconomic planning, upsetting the Central Bank’s calculations regarding inflation. When fuel prices rise without a regular pattern, the price of most other consumer goods also grows. Now, Kazakhstan’s government has several holes to patch in its accounts. Most importantly, however, it needs to restore confidence in the public that it will deal with the chronically precarious situation of domestic fuel supplies. Kazakhstan Hopes to Net Greater Energy Profits with Karachaganak AgreementKazakhstan's Energy Company Continues to Borrow to SurviveThe Real Future of Green Energy in KazakhstanKazakhstan’s Top Party Picks President, Meanwhile the Youth Debate the FutureHow Can Kazakhstan Revitalize Its Civil Society?